New York, New York – Ameringer | McEnery | Yohe is pleased to announce its first solo exhibition of paintings and sculptures by Markus Linnenbrink. there were songs before there was radio will open on 6 September and will remain on view through 6 October 2012. 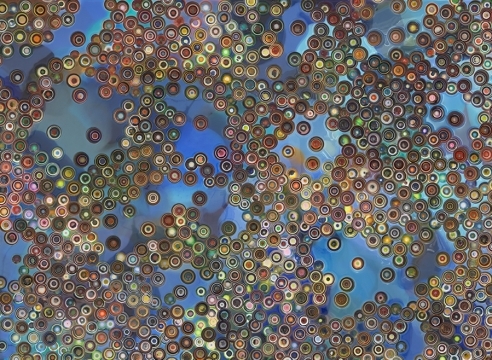 A reception for the artist will take place 6 September, between 6:00 and 8:00 PM. The public is welcome. The paintings and sculptures of there were songs before there was radio are a testament to Markus Linnenbrink’s vibrant and energetic use of color. Linnenbrink mixes epoxy resin with a myriad of pigments to form a full spectrum of colors. While working, Linnenbrink is able to choose colors that are opaque, translucent, light and dark to create his bright eye-catching work. The medium of resin is applied to wooden panels either directly or is applied over photographs creating curtains of color, which form his three-dimensional sculptural paintings. The first encounter with one of Linnenbrink’s paintings or sculptures, so magnificent with color, begs the viewer to face the sensation. After that moment, the intellect returns and the viewer can begin to reflect on his or her experience. The extreme glossy finish of Linnenbrink’s work causes many to impulsively reach towards it, to discover what the eyes can only partially grasp. However, unable to touch the work, the viewer has to rely on his or her eyes and what he or she is able to interpret through that sense. For this exhibition, the wall painting was imagined by the artist as a way to unify separate, multifunctional spaces in the gallery. Linnenbrink turns a transitional and functional part of the gallery into a site-specific painting installation. A room that is usually not used as an exhibition space is transformed into a work of art. Markus Linnenbrink was born in Germany in 1961. He attended Gesamthochschule Kassel as well as the Academy of Fine Arts in Berlin. Recent solo exhibitions include “too early and always all over again” at Patricia Sweetow Gallery in San Francisco, CA and “here is what you gonna do” at ft-contemporary, Berlin. Recent group exhibitions include “Local Color” at the San Jose Museum of Art, San Jose, CA, “ROY G BIV” at Waterhouse&Dodd in New York, NY and the 2010 Beijing Biennial. His work is included in the permanent collections of The Hague Ministry of Culture, the Hague, Netherlands; Harvard Business School, Cambridge, MA; Harvard College, Cambridge, MA; the Hood Museum of Art, Dartmouth College, Hanover, NH; Museum Neue Galerie in Kassel, Germany; the San Francisco Museum of Modern Art, San Francisco, CA; the San Jose Museum of Art, San Jose, CA; UCLA’s Hammer Museum, Los Angeles, CA; Wellesley College, Wellesley, MA and the West Collection, Oaks, PA, among others. Linnenbrink lives and works in Brooklyn, New York. 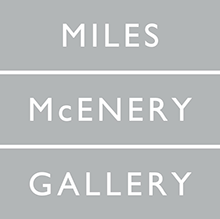 Ameringer | McEnery | Yohe is open Tuesday through Saturday 10 AM to 6 PM and by appointment.